I’m the Writer… and you are the Reader. That is the deal we struck, right? That simple principle is the foundation that our shady therapy-session/deep, meaningful relationship is based upon? Yes, I believe that it is; and I apologize for not holding up my end of the bargain lately. Sure, I’ve got a million reasons why I dropped the ball: I’ve been busy, I’ve been distracted, I’ve been (insert lame excuse here). I had a good mind to tell you that I was dispatched to a little-known, war-torn corner of the earth to lead an elite army of ninjas in a crusade against an evil alien insurgence, but I figured you’d probably see right through that. No, the culprit is pure, unfettered scatterbrainedness, but I promise to do better from now on. If I’m being honest, it’s not entirely by choice. My hands are being forced. Not a physical one… that would just be silly. Where on earth would I keep it? I suppose he could live in the pool, which would be one hell of a surprise for the spring ducks, any potential skinny-dippers and my cat (hm… I’ll have to give that some thought). 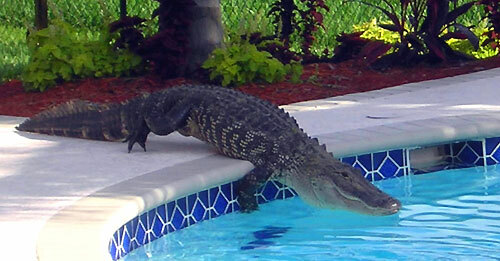 But my alligator is very real all the same; alive and well, living deep in the watery recesses of my mind. Or at least, that’s where he used to live. As of late, he’s taken up residence much closer to the surface and made his presence far more pronounced. He stalks me some days; I can tell he’s there, his low steady growl forming the white noise between my thoughts. And as crazy as this may sound (as if this entire thing doesn’t already sound insane), I swear to you that I can feel the heat of his breath on my neck and the intensity of his stare, burrowing deep into my soul like a racoon digging for grubs in your lawn. He has become the Leading Man in my dreams, morphing from otherwise benign objects–tables, sidewalks, coffee cups, flamingos–into his unavoidable, iridescent self. (Yes, he’s a colourful beastie… and don’t tell me you don’t dream about flamingos, because you know you do). He snarls and growls, his teeth bared and jaws stretched wide, ready to devour me whole. I wrote him off at first, dismissing him as another sign of my need for a good psychiatrist, or chalking him up to too much cheese before bed. But he’s persistent; he comes back to visit night after night, hunting me down and terrorizing my mind. A few weeks ago, perhaps as a way to avoid sleep and to dodge yet another run-in with my friend, I dove into the short story I wrote (and you Read, as per our arrangement – thank you so much for that, once again). And when I finally finished my story and posted it for the world to see, and got comfortable enough to sleep undisturbed by lizards and such, he was waiting for me. But instead of morphing into His Scaly Self from a potted plant, or chasing me through a sewer or snapping at me from the inside of my coffee cup, he was quiet and controlled – a far cry from his usual hungry and insatiable self. His eyes were just as wild and intense, but his mouth was closed and his body was still… not a growl or snarl to be seen. He was observing me as if he was watching a movie, waiting to see what came next. He left for a while after that, retreating into the swampy bayou in my mind that he came from. That is, until a few days ago. The dream marking his reappearance started innocently enough: I was sitting in a chair in my living room reading a book and my family was sitting around watching TV. I looked up from the pages for a moment and returned to my book, only to realize that it had started to shift in my hands; the pages slowly twisted and turned, the surface of them becoming colourful and slick, the colours swirling and twisting like oil floating on water. The cover grew cold and scaly in my hands, the sharp ridges started to dig into my skin. I tried to drop the book on the floor, but it hooked into my flesh – and when I looked up to show my family what was happening, the room was empty. I looked down at my hands and he was there; his eyes were locked onto mine, his teeth bared and mouth open…growling and discontent, demanding to be fed once again. Yes, it all seems whacko. And you may be content to just brand me the Emperor of Broken Toys and be done with it, and I wouldn’t blame you. But I know I’m not (certifiably) crazy, because I know who my little friend is. He’s the part of me that is almost obsessively focused on what lies ahead; he is the root of my impatience and the heart of my insatiability. He’s the manifestation of my aggression, toeing the line between control and recklessness, unapologetically intolerant of anything but satisfaction. Ultimately, he’s the reason I put pen to paper in the first place and is the architect of everything that makes me, well, me. And he’s pissed because he has been malnourished – perhaps for much longer than I realized. So to keep the peace, he needs to be fed…and he will be. And part of that feeding involves our little agreement: I will Write, and You will (hopefully) Read. Who needs a $300/hr. therapist, when I have you? Stay tuned, Faceless. Maybe Facebook should buy Detroit? Great post. You are a lovely writer! WOW! That was very descriptive, and that part was fun, but all kidding aside, you really are wrestling alligators….right?